The Viticcio vineyards and holiday apartment rentals are surrounded in the heart of Chianti Classico, just 2 kilometers from the city center of Greve in Chianti. The 9 self catering apartments in typical Tuscan decor, are spacious and well equipped with modern kitchen appliances, WiFi, AC and Sat TV. Surrounded by the family run vineyards, there are many outdoor spaces for picnics, relax, or sunning by the pool. The convenient position near a special Chianti town with restaurants and shops, makes it possible to indulge in an evening stroll or an early morning coffee in town. From town, you have easy access to regular buses to Florence. The two restructured farmhouses at Viticcio feature a total of 8 cozy self catering vacation rentals for up to 6 persons. Each apartment has been elegantly furnished in typical Tuscan style with modern touches and accents to ensure maximum comfort while exploring the wonders of Chianti, Florence and Tuscany. You will find classical elements like wood beam ceilings and cotto floor, as well as WiFi service, flat screen TVs and AC in all units. The apartment Beatrice, for up to 4 guests and is set on two floors, it boasts a private patio in the shade with a BBQ, and outdoor dining space overlooking the pool and gardens. The vacation apartment Dolce Arianna, located in the first farmhouse, will host up to 2 guests with one romantic double bedroom and a large bathroom upstairs and a sofa bed for two persons in the living room. Per Camilla is a one-level studio apartment a full kitchen, a living room with sofa bed and a romantic double bedroom and bathroom with shower. The apartments of Viticcio Farmhouse are equipped with independent air conditioning and heating, together with linens and kitchenware. There is ample private parking. The apartments have access to a shared pool set in a commanding position above the vineyards, with a view of the valley below and the castle above. Next to the pool is a well maintained garden for games and activities including an improvised game of soccer or for the smaller children a slide and climbing game. The holiday rental Monile, with 88 square meters of space, is suitable for up to 4 persons. Newly restored in 2016, offers a spacious living room, kitchen, bathroom, and two luminous double bedrooms. The small apartment Rosa Rossa is set on two floors, with the living area on the ground floor and the double bedroom and bathroom on the first floor. Family suite with two bedrooms (a double and a twin), Mezzola features a mini kitchenette with microwave and frigo. These newly restored rooms with a large bathroom are set on the first floor and promise great views. Another family suite is Prunaio, with two bedrooms (a double and a twin) and two bathrooms. The newest apartment, Belvedere, is a deluxe accommodation with four bedrooms and three bathrooms, a private pool and garden area featuring a covered patio and outdoor bathroom which is perfect for larger families or group of friends traveling together. You can read about Belvedere di Viticcio at this link. In addition Viticcio organizes guided tours to their wine cellars, vineyards and a guided wine tasting. It is also possible to arrange for a chef to come in for meals. Located a kilometer from the city center of Greve in Chianti, Fattoria Viticcio is situated in the heart of Florentine Chianti. 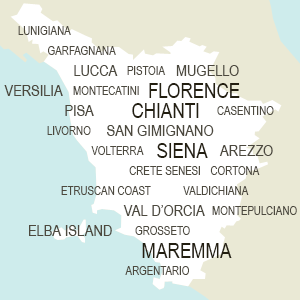 Florence, the cradle of Renaissance, is within 30 km distance, while the gothic Siena is about 40 km distance. It's certainly located in a strategical position that makes Fattoria Viticcio the perfect base for Tuscan holidays. Just few kilometers there is the charming Greve in Chianti renowned for its particularly shaped piazza. In the surroundings there are several important destinations such as Panzano in Chianti, Castellina in Chianti and Gaiole in Chianti.